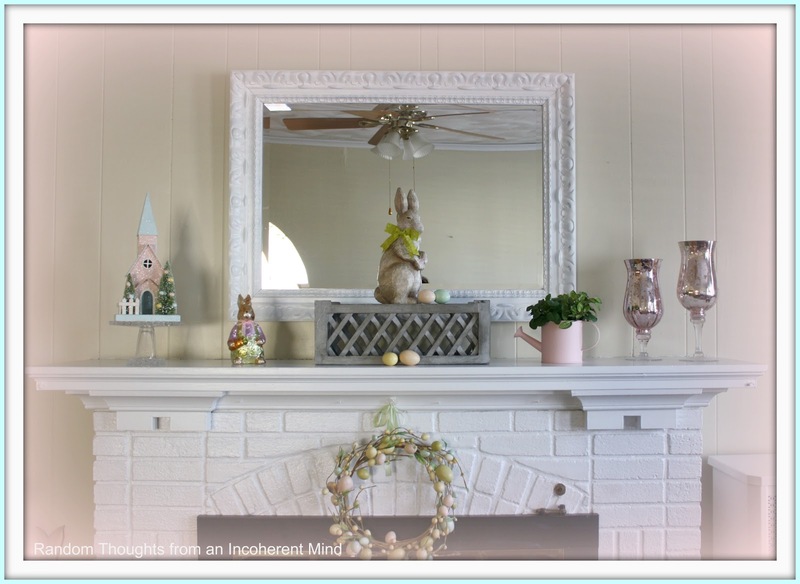 I know that I teased you a few weeks ago about my Spring mantel, but today I'm going to share it with you because today we continue our Great Spring'tacular Link Party Parade! My friend, Shannon of Fox Hollow Cottage, is hosting the Mantel Party today and it's always a blast when she's around! I had an epiphany. The wall above my mantel is just so big and the mantel is just so big, I had had enough of always trying to find something to fill the wall for each season. Enter the epiphany mirror. 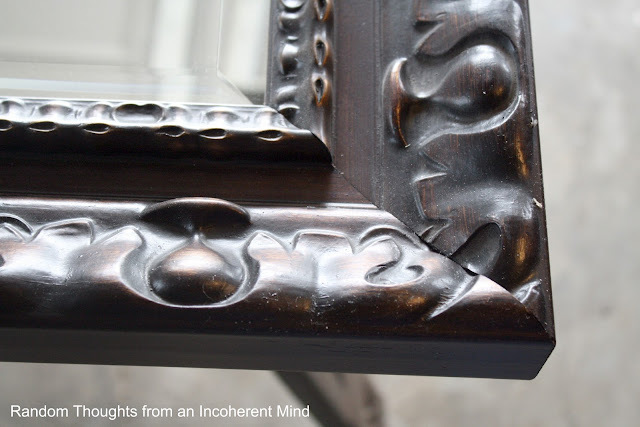 This is what the mirror looked like when I bought it at Hobby Lobby. Nothing some white paint couldn't cure! Another Michael's purchase, this year. 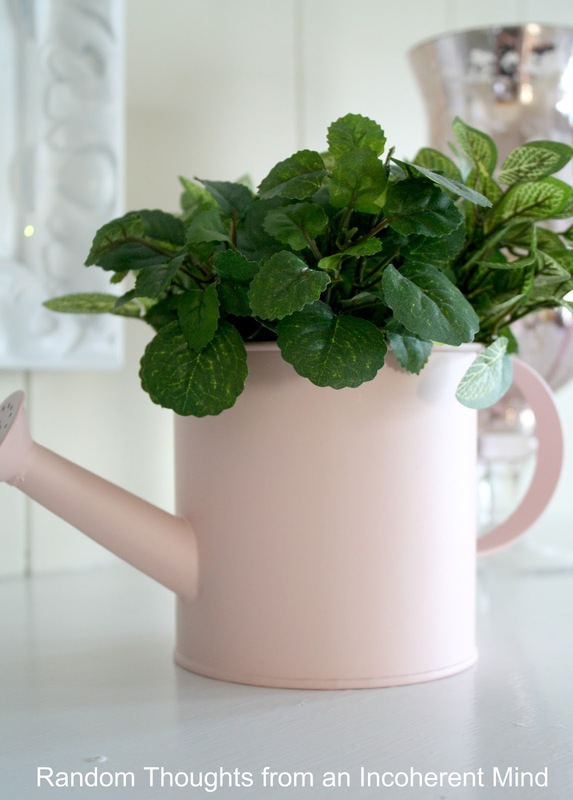 I just love the soft pink color of this watering can. 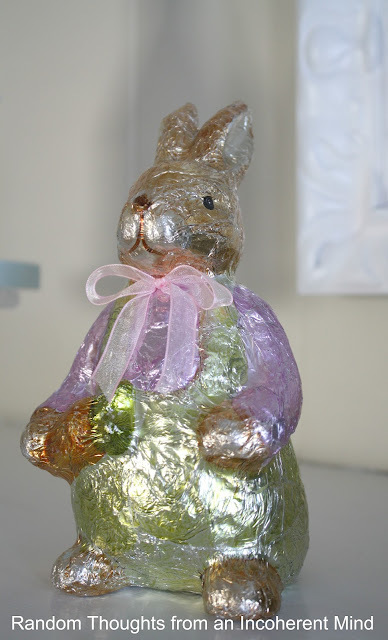 A "foil" wrapped bunny that I bought last year. I think he's fun because he reminds me of the foil wrapped chocolate bunnies from when I was a kid. I don't think they make them like that any more, do they? 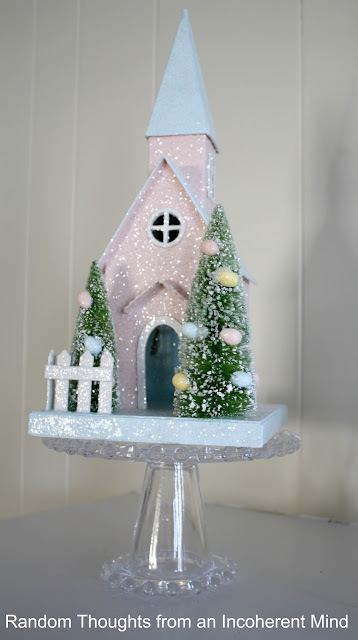 This glittery church came from Home Goods last year. I love these glittery type houses/churches. Add a bottle brush tree or two and I'm sold! Here's a close up of the book covered bunny. Another Home Goods purchase, this year. I love how simple, light and airy my mantel feels this year. If you've got a mantel you'd like to share, please head on over to Fox Hollow Cottage and link up with me right here. If not, come take a look at all the inspiring mantels other bloggers have linked up. It may start a spark for you! Oh My Goodness!!! It's absolutely stunning!!! I love your mantel, reminds me of spring so much! Yes - the bunny does remind me of the foiled wrapped ones when I was a child also. I will try to get working on my mantel so I can include it on the Mantel party! That is so pretty! I have been dinking with my mantel off and on all day today. I'm just not happy with it yet. I love what you did on yours. Gina, I love your mantel! It's gorgeous! It's so springy! The pastels are gorgeous! 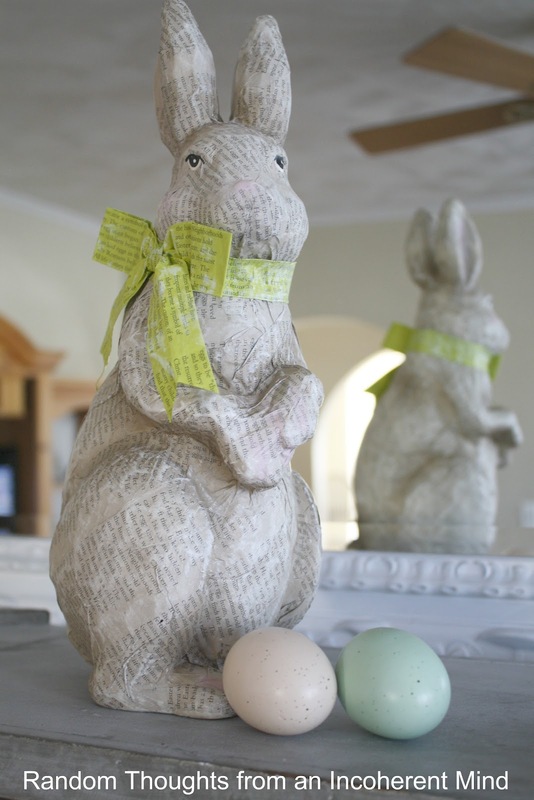 I wish I had a Home Goods close- your bunny is amazing! Love your mantel. I don't have a mantel but had planned to join with all of you and get my bookcase/mantel decorated. The day is not over, maybe I will get to it. I will go check out the other mantels linked up. Happy almost spring! I love it G! So many pretty elements... the foil bunny is darling. And I don't think they do... I looked a few days ago and they were all chocolate. It all came together beautifully!! I just love your Easter/Spring mantel. It's so pretty and perfect for the season. I just love the bunny. 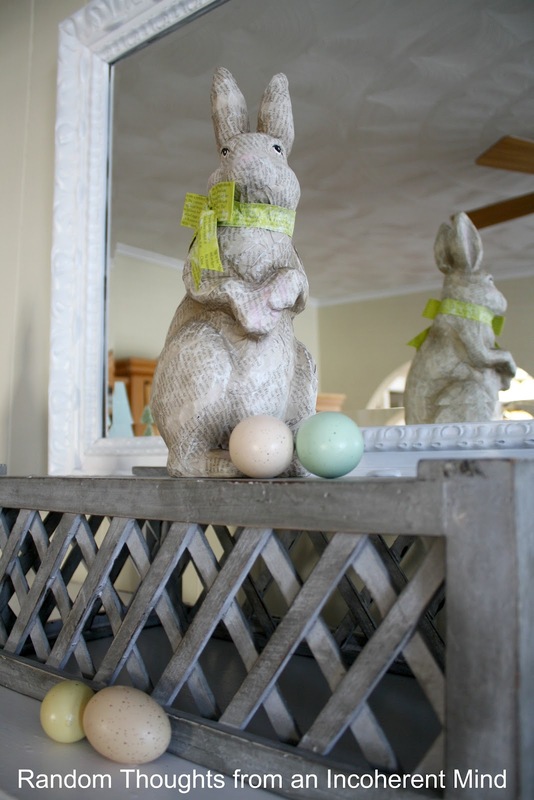 Love your mantel Gina especially the lattice with the large rabbit on top. Great party, thanks for being one of the hosts. This mantel is so pretty. Your mantel is so lovely, Gina! I kept mine very lean and tranquil this time, too. I love how the simplicity gives each piece more of a statement. Just lovely! Beautiful Miss Gina. Simple, yet makes a hoppy statement! Love it Gina, it does look lighter and airy, so nice after all the winter months! I remember the foil wrapped bunnies too, I think DT has some that come like 3 in a box! I have got to get myself a mantel! Yours is so lovely Gina! You certainly always know how to decorate it, no matter what the season. Very sweet airy mantle. I love mirrors and have them all over instead of art. Great idea to turn your lattice box upside down and use it as a shelf. Perfect! I think it looks perfect, the big mirror looks great...I personally love the minimalist look and not a lot of do dads...just me! Beautiful Gina! I was eyeing that book covered Bunny today at Marshalls it sure is cute. I love your adorable mantel. It's the cutest Springtime look. The mantel is so spring and festive looking. Very pretty. I like those glittery things as well. Loving the pink mercury glass! How often to you switch up your mantle? Mine is just one way and I haven't yet ventured into changing it seasonally. Great minds think alike:) I love your mirror makeover! Everything looks fresh and springy! Ps your photos are awesome! 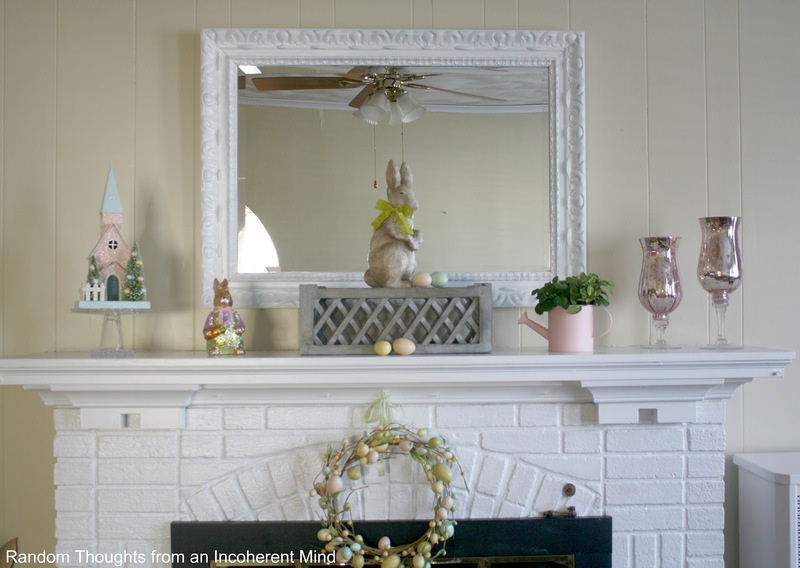 I love your mantel and how that bunny is reflected in the mirror! Elevating him was a great idea. Love that soft pink can and the foil covered bunny, too. I hate to admit that I haven't decorated my mantel yet! I think it is absolutely wonderful. Hey Gina! Thanks for linking this up! I love your Easter mantel! I'm featuring it tomorrow at Mantel Monday! Your mantel is so sweet and pretty, Gina! I love the soft colors ~ it all goes together so nicely. 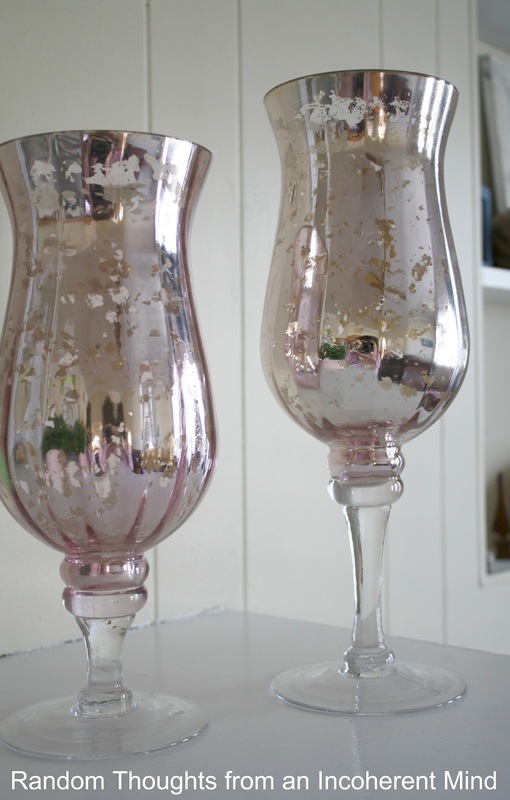 Your pink mercury glass is beautiful!! All of your things are so pretty. I loved those glitter houses when I saw them at HomeGoods last year. Didn't buy one, but I saw them back this time too. Love those pink mercury glass candle holders. Wanted those the last time I was at Michael's, but didn't know where to put them. I have so much "stuff" right now, I'm trying not to buy unless I know exactly where to put it. Goodness, I sound cheap don't I? Hee hee! I think I just need to come to your house to enjoy all the pretties! Thanks for sharing your mantel decoratins at my party.